All the beauty and serenity of a postcard, right in front of your eyes. The smell of saltwater fills the air as fishing boats ebb and flow in the harbour. A bald eagle surveys the landscape from just offshore, while on the ground, a bustling main street is alive with the sound of merchants and commerce. 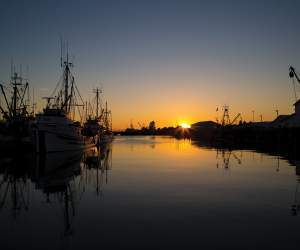 You’ve just stepped foot in the historic fishing village of Steveston, and right away, you’ll realize why it’s one of Richmond’s most popular destinations. Few other places offer such a clear glimpse into Pacific Canada’s history as Steveston’s beautifully-preserved National Historic Sites. The Gulf of Georgia Cannery National Historic Site was once the epicenter of Western Canada’s fishing industry, which sparked the city’s growth and economically supported the region in its early days. Today, it’s a popular interactive museum presenting the history of the fishing and canning industry on the West Coast through fascinating guided tours and interactive exhibits. Nearby, the Britannia Shipyards National Historic Site invites visitors to experience how fishermen used to live through boom and bust. It’s also where many of the region’s wooden fishing boats were once hand-made. Tours are offered here, giving you the chance to really immerse yourself in maritime history. For a modern-day example of the industry, head to Fisherman’s Wharf and see the daily catch, sustainably caught straight from the Pacific Ocean. You can even buy some of it directly from the very ships and people who caught it! Aside from the National Historic Sites, there are plenty of other representations of how things used to be in Steveston. You’ll find opportunities to get up-close and personal with historic town life at the Steveston Museum, the Steveston Tram, and at London Heritage Farm. Set sail from Steveston for whale watching expeditions and eco-tours, where you might spot sea lions, herons, eagles, a pod of black-and-white orcas, or even majestic humpback whales. Back on land, you can rent a bike and explore the city’s 80 kilometers (50 miles) of dykes and trails—Steveston is surrounded by pathways perfect for walking, biking, and taking in breathtaking water and mountain views. Those looking to relax can unwind at Garry Point Park, where you can see Washington State’s Olympic Peninsula on a clear day. Fans of ABC’s Once Upon a Time may recognize Steveston as Storybrooke, the show’s fictional town. Pick up a free walking tour map at the Visitor Centre and explore all the historic buildings and enchanted settings featured in the show. Steveston’s shop-lined streets offer an eclectic mix of fashion, food, and gift shops. Many feature handmade products and exquisite creations from local artisans and can only be found here. Steveston is the perfect place to take home an authentic piece of Richmond. Quirky restaurants, cafes, and bakeries have been mainstays in Steveston for decades, but the seafood eateries are the showstoppers. With a plethora of fresh-caught fish that always varies based on the daily catch, you’ll be hard-pressed to find better seafood. On sunny days, head to the patios along the wharf, pull up a seat, and enjoy fresh fish ‘n chips while watching the boats come and go in the marina. True to its character, there’s always something fun happening in Steveston, any time of year. Don’t miss the parade and legendary salmon barbecue at the Steveston Salmon Festival on Canada Day (July 1), and come back in July for the Richmond Maritime Festival, featuring live music, dancers, and storytellers—perfect for young buccaneers.